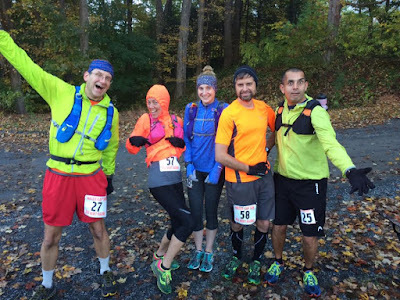 Early Saturday morning, Pete was driving Alison, Bob, Todd, Prem and I to the start of the inaugural Water Gap 50K in the Delaware Water Gap/Poconos region of Pennsylvania. As we traversed the winding roads and rolling hills, it felt like we were on a roller coaster. Little did I know that this race would also be an emotional roller coaster and the hardest race I've run in a long time. The 6 of us had driven to Pennsylvania on Friday afternoon and were staying at a sweet HomeAway rental in Dingmans Ferry, PA, complete with a fireplace, hot tub and lofted bedroom. Friday night we made veggie pizzas for dinner and enjoyed Alison's apple cake, Todd's apple pie and Prem's peanut butter cookies for dessert. Saturday morning we ate an early breakfast and made our way to the race start. The course follows the entire McDade Rail Trail from Hialeah to Milford Beach, along the Delaware River. The MRT is mostly wide crushed stone/cinder/paved trails with a couple of sections of technical single track. 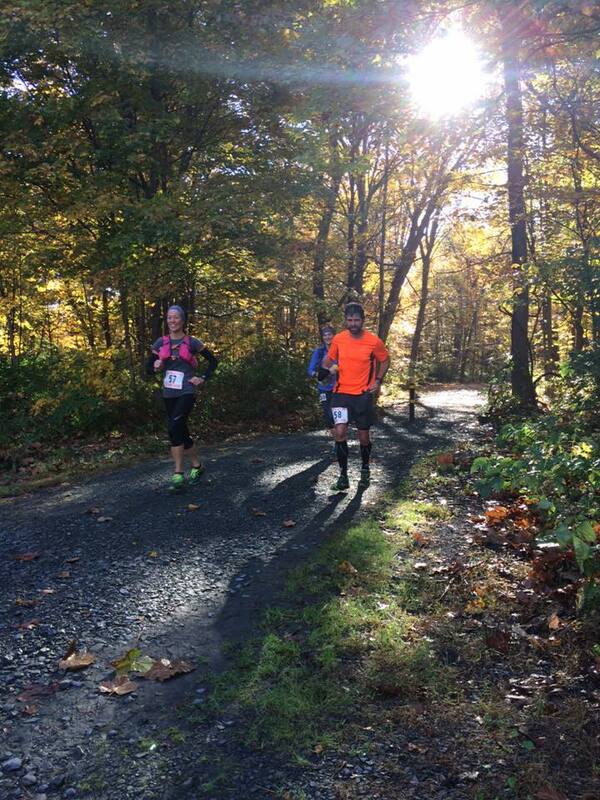 It was a chilly 38 degrees at the start, but it was sunny and dry, a perfect fall day. The trails were beautiful, especially this time of year with the leaves in full autumn colors. The course played to my strengths in that it was non-technical, fast and flat (there were some rolling hills but the signs warning "Steep Hill" were almost laughable as they were not even close to the kinds of hills we usually run), but also to my weaknesses in that it's a much harder surface than the trails I usually run and my joints do not handle repetitive pounding well. The adventure begins. Thanks to my favorite husband for the pics! The first few miles flew by and I had to keep reminding myself to rein it in and not go out too fast. I was running with Bob and then we caught up to Alison and Todd and I thought there is no way I should be up here running with them. Pete, driver/crew/husband extraordinaire, met up with us at several points along the trail, always seeming to be there at exactly the right time to take our gloves/hats we no longer needed or give us sunglasses. I remember Alison saying we were almost at the halfway point and me being surprised by how far in we were already and how good I still felt. That would all change, almost immediately. 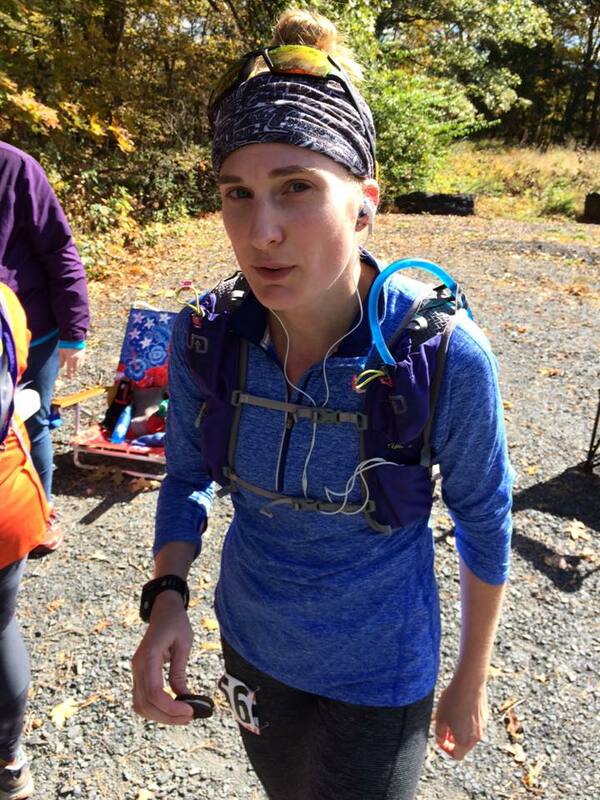 A little after mile 15 my groin muscles started to ache which was new and weird, and not in a good way. Alison gave me some Arnica and then I fell behind her as the race started to go downhill for me, and not in a good way. The groin pain went away but around mile 17 my left ankle started hurting and the pain worsened with every mile. I seriously considered quitting the race. Then came the bargaining. I could stop now and call it a training run and then run Mendon 50K in a few weeks. Then that train of thought devolved into I'm not running another race this year and then further into I'm not running another race ever again. The only race I've ever DNFed was 3 years ago, also in the Poconos. So I was hobbling along, haunted by the ghosts of failures past and the mean voice was all Forget Lucien Moran, The Poconos is your real nemesis. Why did you come back to this place? For redemption? You're not going to find it. You're not cut out for distance running. You don't have what it takes. You're not a good enough runner, friend, life partner, person. You're not good enough. You're not enough. 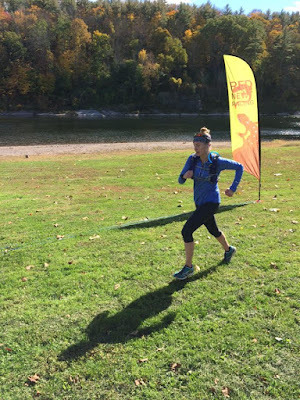 Since it hurt just as much whether I was going slow or fast, I decided to just pick up the pace and at least get the suffering over with as quickly as possible. Then the drugs must have kicked in because I started to feel good again. Never before in a race have I experienced such a drastic 180 degree mental and physical turnaround. I caught back up with Bob and he was as surprised as I was to see me looking so much better. At the last aid station, I saw Pete, who had purposely waited to see us until it was close enough to the end that we wouldn't be tempted to quit. I hugged Pete, then it was only a little over 5 miles to the finish and it became a race between me and the half-life of ibuprofen. There was about a 2 mile section of technical, leaf covered single track that afterwards we referred to as the un-runnable trail. But actually I did run most of it, just cautiously so I wouldn't twist an ankle or fall down into the river. There were a couple of guys out in a canoe who waved and cheered as I went by. The last 3 miles, back on the wide stone trails, seemed to take forever. At around mile 30.5, The Pretenders "I'll Stand By You" came on the iPod and I teared up as I took in the beautiful tree covered baby mountains to my left and sunny field to my right. I honestly didn't think I was going to finish this race and it wasn't until the last half mile that I knew that I would. I started sprinting, passed the woman in front of me and then saw Alison up ahead so I gave it everything I had and ended up finishing just behind her. 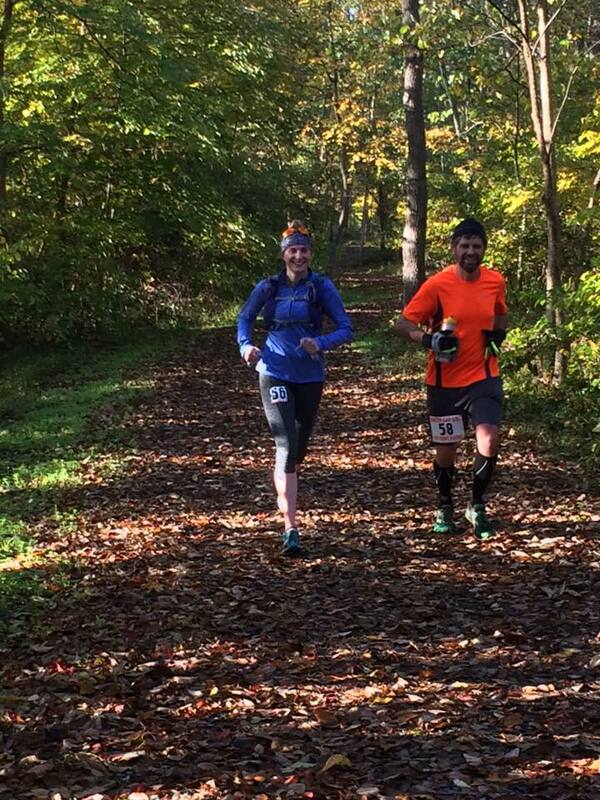 Water Gap was the hardest, but oddly enough, also the fastest 50K I've run. I'd like to say that I finished this race due to strength and heart. But honestly I finished due to vengeance and stubbornness and drugs. Prem, Alison, Bob and Todd are fantastic runners and of course all did well. The race director gave us these awesome metal finisher signs. And our group ended up going home with 3 free pies. (Throughout the race, the RD had placed 6 tiny signs with pies on them and if you found one you got a pie at the end). And all's well that ends in free pie. We did it! For the pie! After the race, we went back to the cabin and got in the hot tub, which felt amazing on my legs. Then there was more eating, lots more dessert and some euchre. Today I'm still walking like an old woman (though that may be due more to me falling down the stairs in the dark while trying to get from the loft bedroom to the bathroom this morning than from the repercussions of the race), but a very happy old woman. 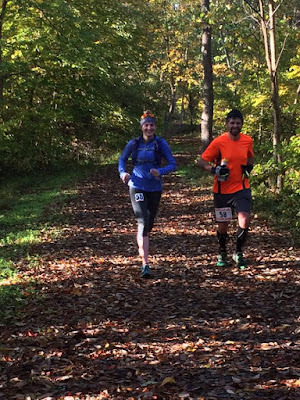 I liked the laid-back, minimalist feel of this race and it was a nice trail. But I'm not sure if I would do this race again. I think it's just too much pounding for my old body. Though maybe it would feel better with more padded shoes, like Hokas. Also, the lure of free pie is strong. So never say never I suppose. In any case, it was another excellent adventure with some of my most favorite people. And for that I am grateful. Thank you to Red Newt Racing and all the volunteers and especially the mom with the drugs. Thank you to Alison, Bob, Todd and Prem for being the best people/adventure friends and especially to Pete for being the best adventure/life partner. When people ask why I run, I can never seem to find the right words to adequately explain it. To explain the feeling of a weekend like this one, all the lows and highs and pain and awesomeness. To explain how you can feel like you never want to run again and then 10 minutes later be contemplating your next race and the race after that and the race after that. How you can come to a run as you are and leave so much better. How, like the Rolling Stones song says, "You get what you need." Lyric of the moment: "You can't always get what you want. But if you try sometimes, you just might find, you get what you need..." ~The Rolling Stones "You Get What You Need." 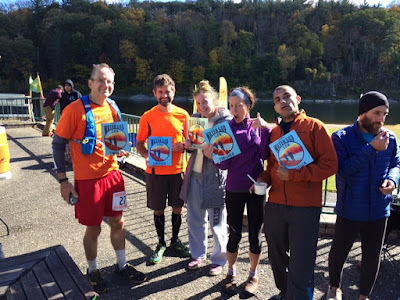 A version of this race report also appears on ultrarunning magazine's website. I stumbled upon this post somehow, and I must say, when I stumble upon your posts I feel like it's a treat! I love your writing style and thoughts. Especially this thought, which I am GUARANTEED to have at least once every single ultra I run: "I seriously considered quitting the race. Then came the bargaining. I could stop now and call it a training run and then run (____) in a few weeks. Then that train of thought devolved into I'm not running another race this year and then further into I'm not running another race ever again." Literally made me laugh right out loud. Thanks Jen!